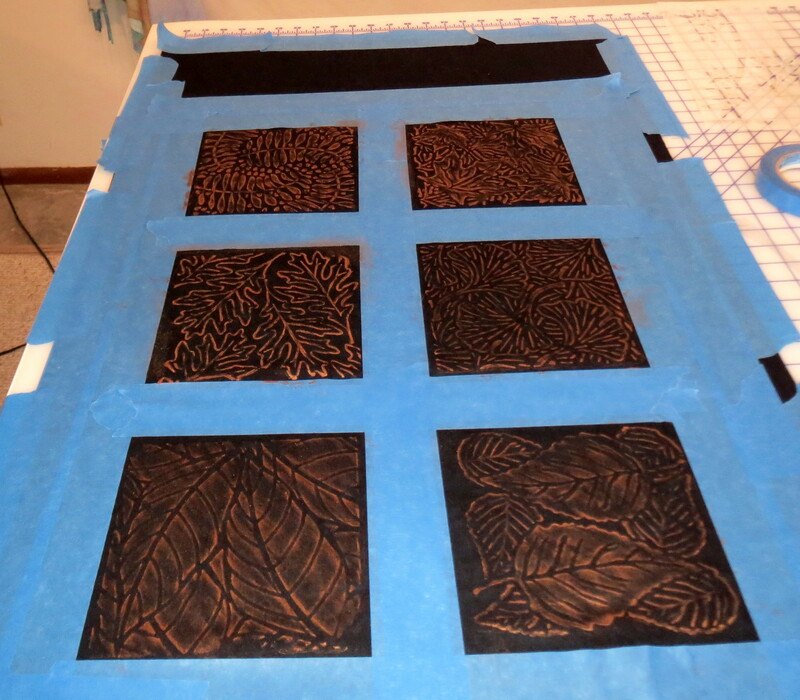 Rubbed leaves colored with gold, bronze, and copper Paintstiks. My photo isn’t great- the actual blocks look very good! Nice and shiny and the different colors add complexity. 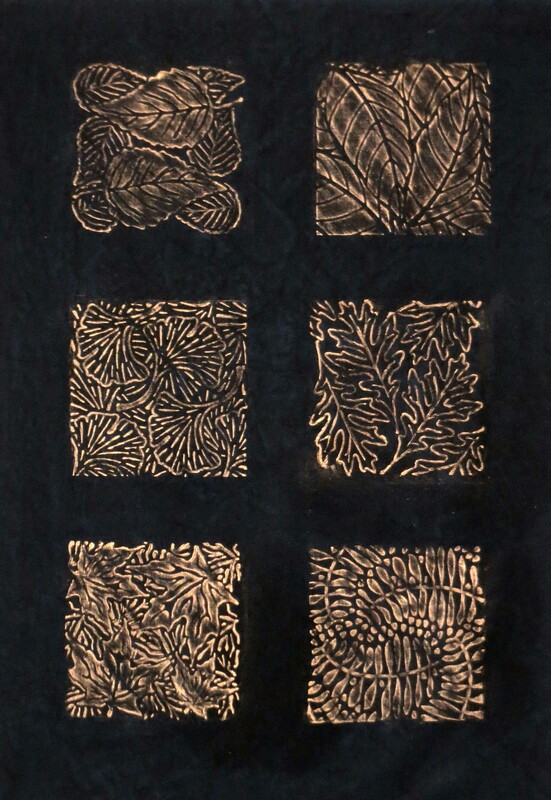 This entry was posted in Contemporary Quilts, Quilt Designer, Quilt Patterns, Quilting and tagged Black and Gold quilts, Paintstiks, Rubbing Plates on April 12, 2014 by Shirley at Mystery Bay Quilt Design. 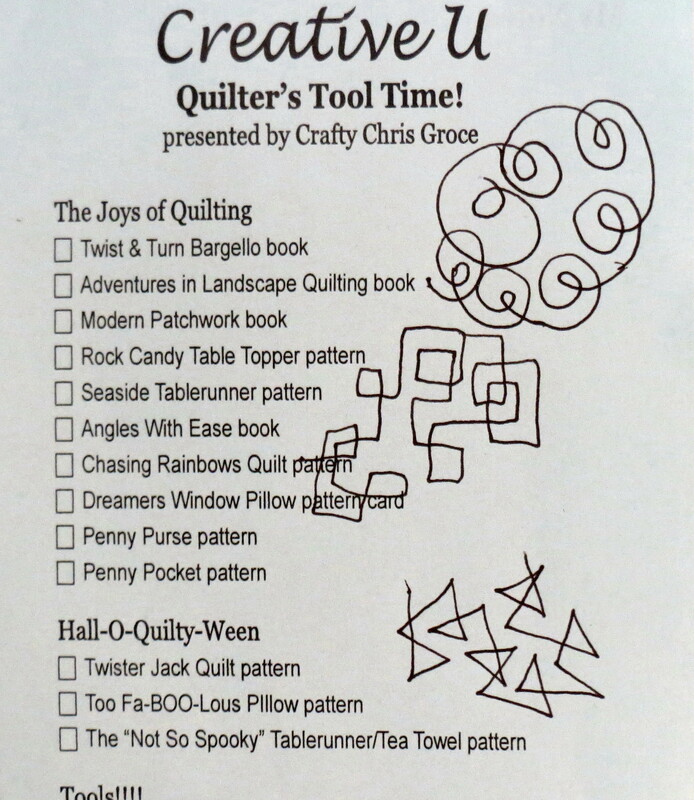 Often students in my quilting classes ask about how to decide what quilting patterns to use for a particular quilt. 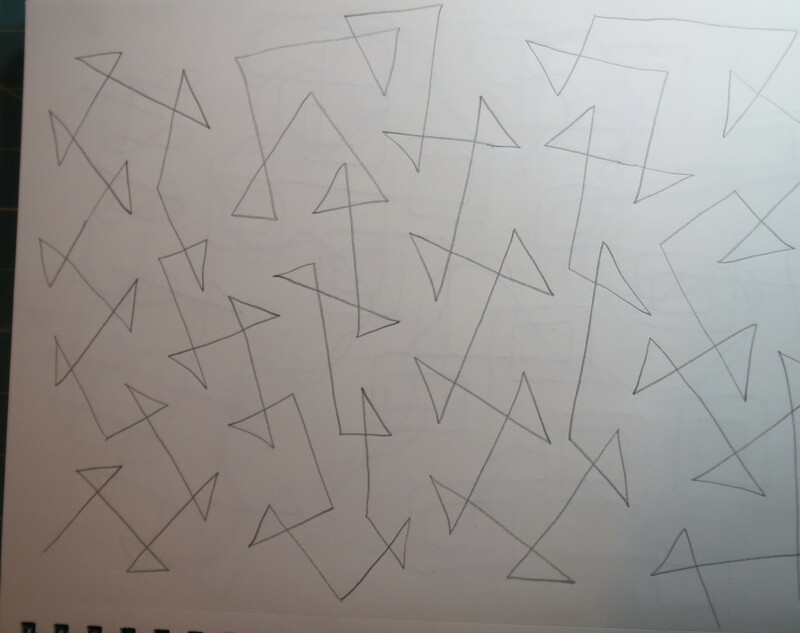 I have been thinking about how I decide to use particular patterns and how I can better answer the question. I don’t have any great answers yet, but I’m still working on it! Jotting down ideas so i wouldn’t forget! I sketched bigger versions of these in my sketchbook and then stitched some of them out this morning. 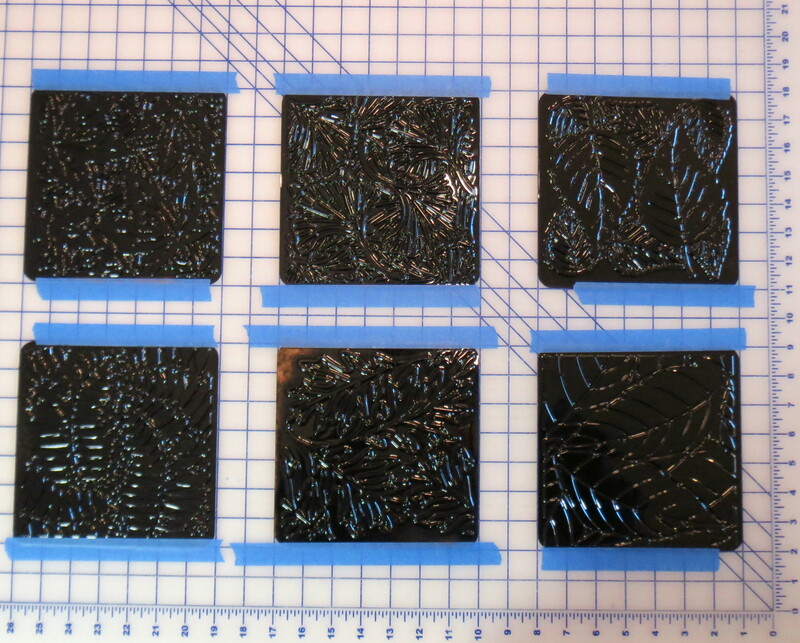 I think I will be able to make these even better with more practice, but they aren’t bad for first tries. 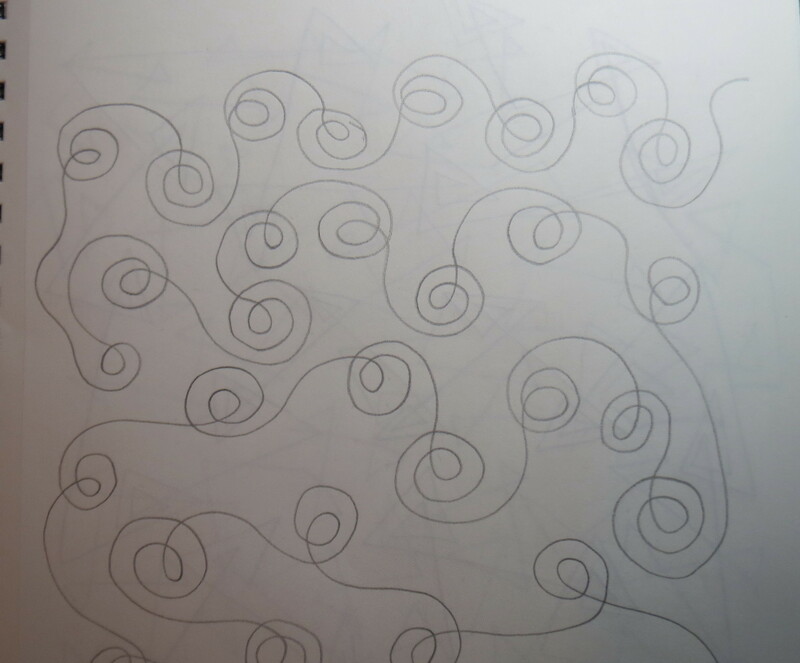 Here is a double loop pattern, as sketched out and then stitched out. 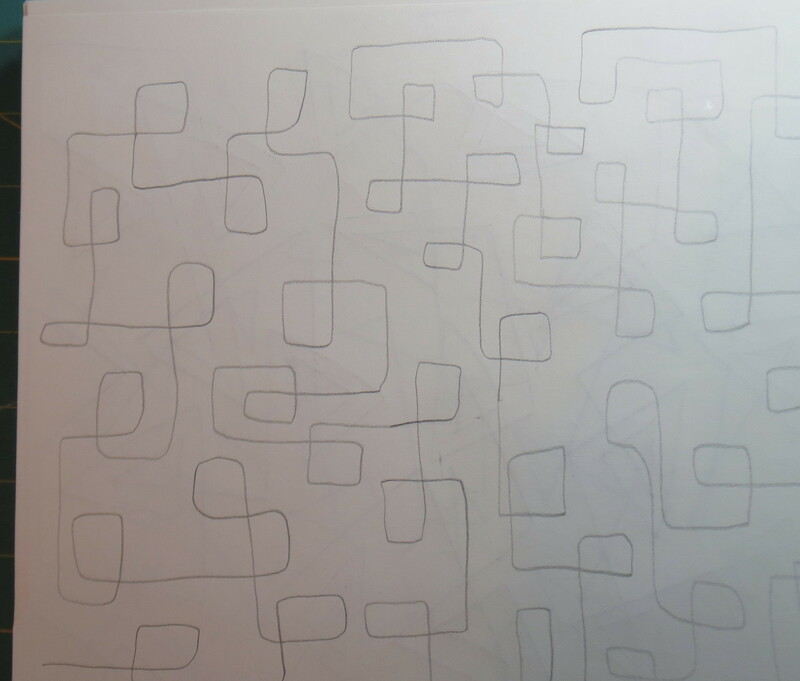 And now the rounded squares. 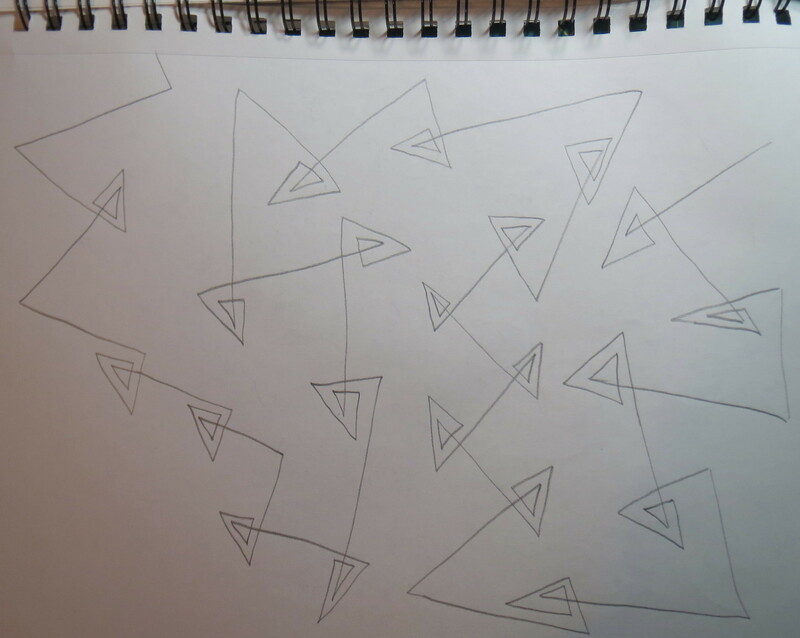 And finally, triangles. 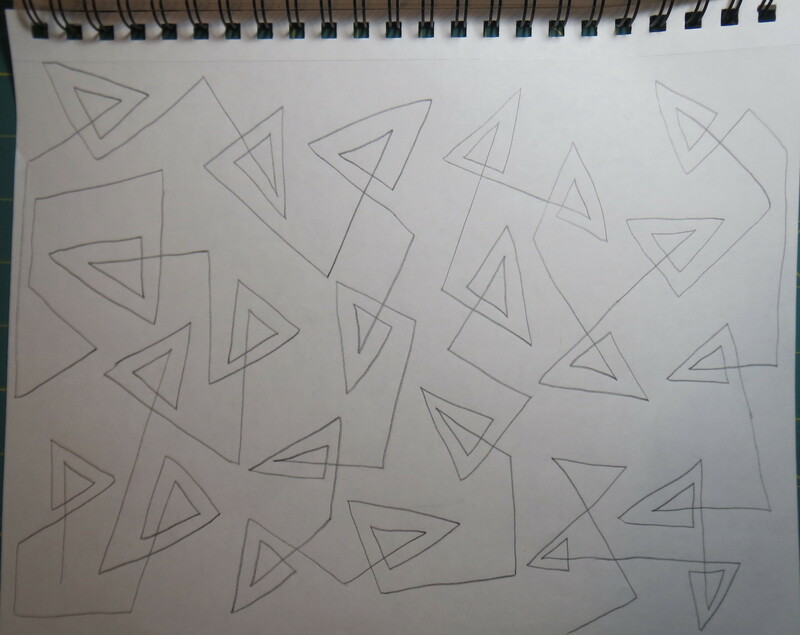 I sketched several versions of these before I finally stitched out the large double triangles. 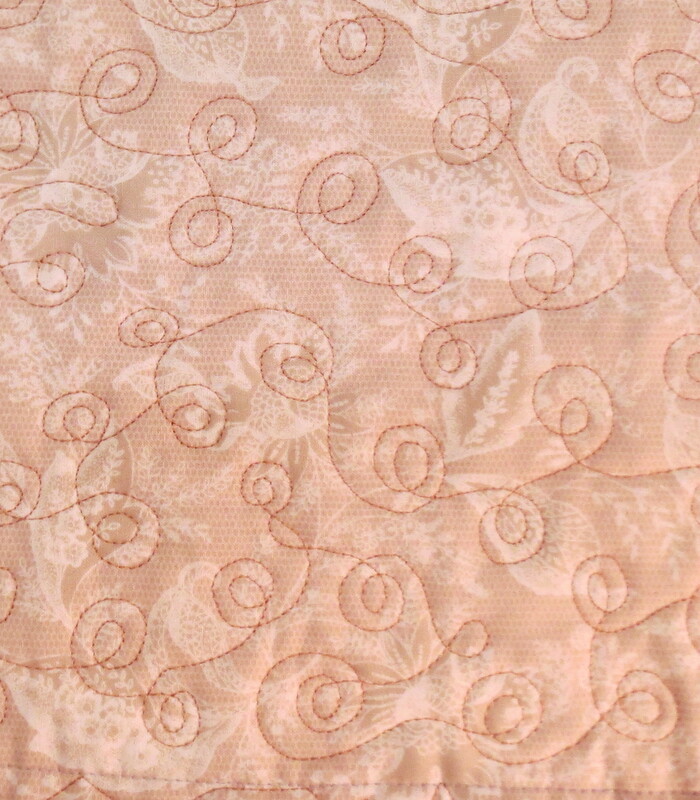 These patterns were pretty quick to stitch and add nicely to my “library” of free motion patterns. Do try them out! 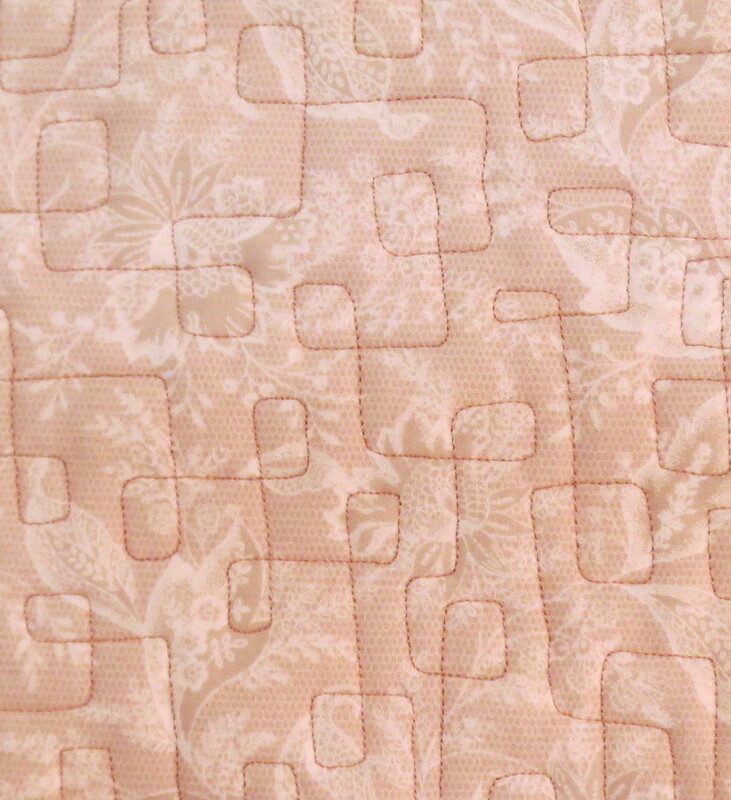 This entry was posted in Contemporary Quilts, Free Motion Quilting, Quilt Designer, Quilting and tagged abstract quilting patterns, free motion patterns, modern quilting on October 31, 2013 by Shirley at Mystery Bay Quilt Design. As I previously announced, three of my quilts will be in the upcoming Pacific West Quilt Show. 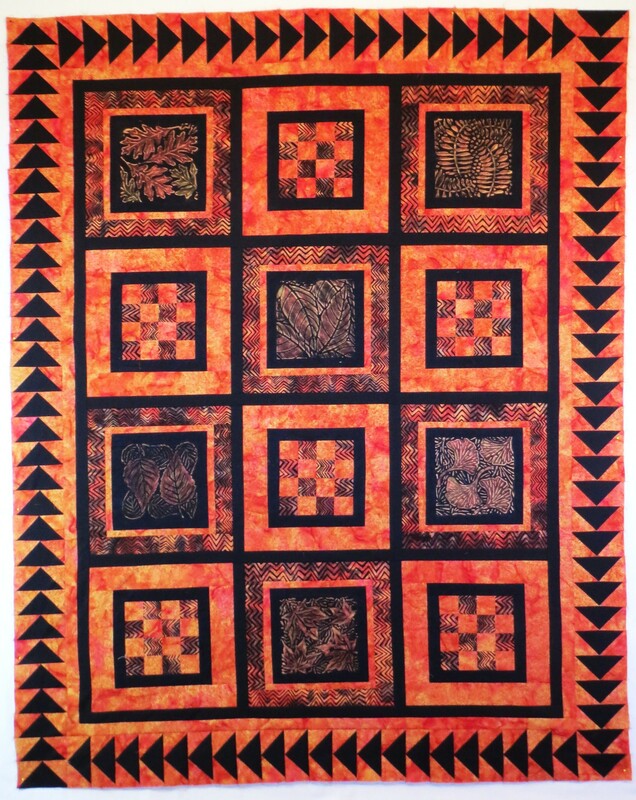 The show management sent me a draft press release, which I modified slightly and sent to the local paper along with a photo of my quilt, “Fireballs”. All three of my show quilts are shown on my gallery page, so you can see them there. Shirley Sandoz from Nordland, WA is a double finalist in the Pacific West Quilt Show to be presented August 23-25, 2013, at the Greater Tacoma Convention & Trade Center, Tacoma, Washington. Her two pieces titled “Leaves In The Wind” and “Fireballs” will compete with 191 quilts entries from the 18 US states and Canadian provinces of the Pacific West region: Alaska, Alberta, Arizona, British Columbia, California, Colorado, Hawaii, Idaho, Montana, Nevada, New Mexico, The Northwest Territories, Oregon, Saskatchewan, Utah, Washington, Wyoming, and Yukon. Over $25,000 in cash and prizes will be awarded to winners in nine categories. The producing organization of this contest, the Association of Pacific West Quilters (APWQ), a non-profit organization, was founded in 1992. APWQ is dedicated to promoting the art of quiltmaking throughout the Western US and Canada. In addition to her two entries into the juried show, Shirley Sandoz also has another quilt, “Tropical Flowers and Sashiko” that will be part of a special exhibit of floral quilts by members of APWQ. 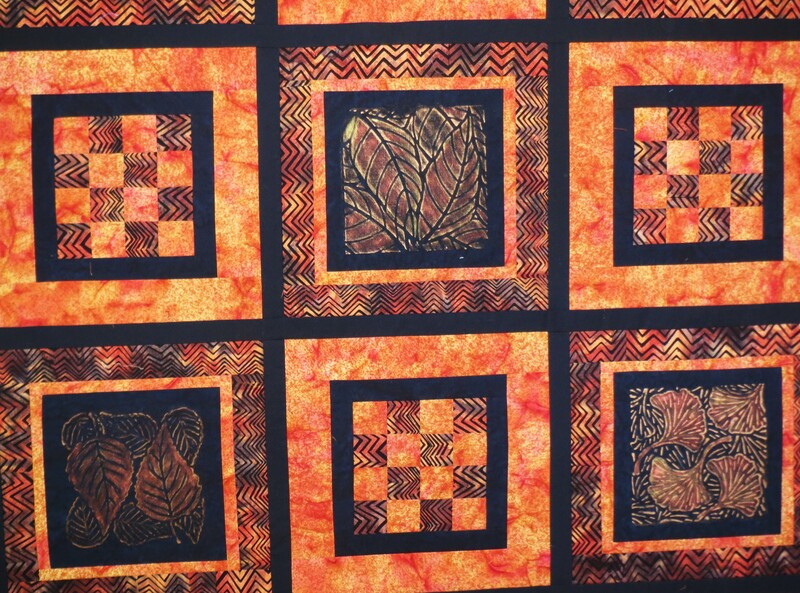 Pacific West Quilt Show attendees will be inspired and awed by the beauty, depth, and diversity of the finest quilts being produced in the region. In addition to the competition quilts featured at this world-class quilt show there will be special quilt exhibits, workshops, special events and shopping in the fabulous Merchant Mall. The Pacific West Quilt Show is open to the public from 10:00 am to 6:00 pm Friday and Saturday, and 10:00 am to 4:00 pm on Sunday. 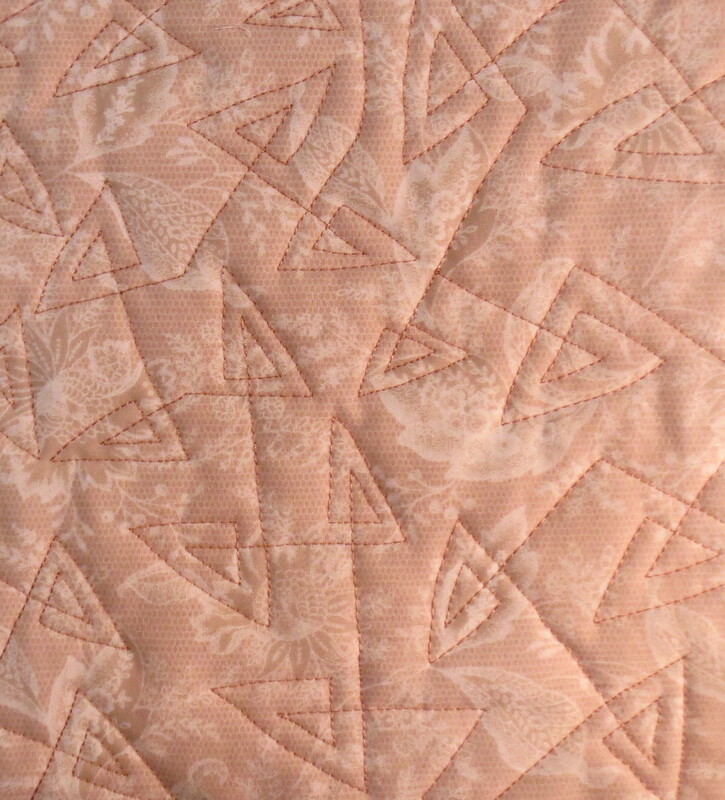 For more information about the 2013 Pacific West Quilt show, please visit www.apwq.org. This entry was posted in Art Quilts, Pacific West Quilt Show, Quilt Designer, Quilt Show, Quilting and tagged Pacific West Quilt Show, press release, quilt show on July 31, 2013 by Shirley at Mystery Bay Quilt Design.